It happens all the time: You need a little something at work, so you grab a piece of candy from the vending machine. Or the kids want to munch on something when they get home from school, so they go to the refrigerator for it. Snacking isn't necessarily a bad idea, according to dietician Elisa Zied, a spokesperson for the American Dietetic Association and author of the new book, "Feed Your Family Right! : How to Make Smart Food and Fitness Choices for a Healthy Lifestyle." Snacks can be nutritious. It all depends on what's being eaten, Zied explained Tuesday in part two of the three-part Early Show series on food and families. 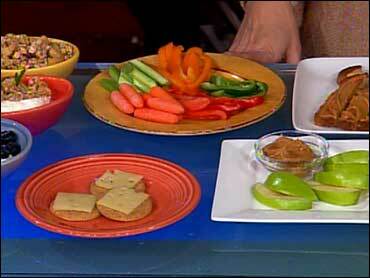 Zied says snacking between meals can be a great way to fill nutritional gaps left by meals. It can be a great opportunity to fit in more foods from the basic food groups, and get the nutrients those foods provide. Also, having a snack between meals, or before an event that involves food, can prevent hunger that can lead to overeating at the next meal or event. Eating frequently can keep your metabolism revved up and keep blood sugar levels steadier than waiting several hours between meals does. But, stresses Zied, beware: Not all snacks are created equal. Think carefully about what you're snacking on. It's just like planning out the right healthy meal. Snacking shouldn't be done mindlessly — it requires a little thought. A piece of chocolate might satisfy that hunger craving, but might make you feel worse later as opposed to eating some fruit or having some carrot sticks. You must calculate snacks into your overall intake of calories, fat, sugar and sodium. Many standard snacks contain "hidden" sugar and salt, which people don't often think about. But you don't have to completely cut out your favorite cookies. It's all about moderation. The snack items that don't fit neatly in to the low-fat dairy, fruits, veggies, or grains categories must be counted, and Zied says you shouldn't consume more than 150 calories. So, even soda or a glass of wine should be counted as a snack. Many snacks, including breakfast bars, popcorn and granola are counted as grains, but are combined with so much fat, sugar and calories that few actually contain whole grains! Some typical snack items contained extra sugars, fat and calories. Remember: Sugar by any other name is just as sweet and high-calorie. "Hidden" sugars include corn syrup, glucose, dextrose, honey, sucrose and malt syrup. A snack you might choose that's high in sugar and fat is a chocolate glazed donut from Dunkin' Donuts. It has 290 calories, 16 grams of fat and 14 grams of sugar. That's as much fat as in about four pats of butter, and the equivalent of almost four teaspoons of sugar. Fourteen pieces of Brachs jelly beans have 27 grams of sugar — almost seven teaspoons! And many people might not stop at a skimpy 14. Twenty-eight pieces would equal almost a quarter cup of sugar. One 12-ounce can of sugary soda has 40 grams of sugar, or about 10 teaspoons. Fruit punch, such as Tropicana's, has the equivalent of eight teaspoons of sugar in a large, 8-ounce box. One ounce, or 15 Lays potato chips have as much fat as two-and-a-half pats of butter. Many people can easily eat 2 ounces. That many would also have 15 percent of the suggested sodium for a full day. One ounce of Rold Gold small pretzels (17) has a quarter of the daily recommended sodium intake for a day. Double that would give you half the daily recommended amount. So, says Zied, a downside of snacking is not paying attention to portions and snacking when you're not really hungry. Many of these high-calorie, high-sugar, high-fat items are very tasty and come in large portion sizes, making them easy to over-consume. She says you shouldn't eat if you're not really hungry, but just don't wait until you're starved to eat something. There's nothing wrong with preventatively grabbing an apple to curb your appetite before you go out for dinner or to an event but it's a good idea to eat only when you're hungry and stop when you're full. Try to have snacks during the day — late morning or mid-afternoon — instead of late at night. After dinner, brush and floss and rinse to prevent eating when you're not hungry. You don't need to avoid anything when snacking, Zied points out, but you do need to make choices. A good rule of thumb is not to buy or keep in the house something that's a trigger food or beverage — something you'll grab just because it's there. Keep "trigger foods" out of the house and plan for them, in controlled portions, on occasion, so you don't feel deprived. Make your extra calories count; don't waste them on foods you don't really enjoy. As for kids, Zied says young ones should definitely snack: They have tiny tummies and get full quickly, so having a few pre-planned snacks throughout the day can help them get enough food, and the nutrients they provide help them grow and develop optimally. But here's where you have a chance to teach your kids better snacking habits: Instead of automatically offering typical snack foods devoid of nutrients, choose foods from the key food groups. Consider low-fat yogurt, whole-grain crackers or vegetable slices served with low-fat salad dressing. Zied says your child needs to limit the intake of snacks from the pantry, such as cookies. It's best if they save that craving for sweets for an after-dinner dessert, rather than using up the sugar intake on a little snack. Also, a recent study found that young kids aged 2-6 who ate in a large group (nine people) ate 30 percent more than they did when served a snack in a small group with only three children. So, the researchers suggested that the sight and sound of others eating encouraged kids to overeat, so that's also something to consider when you offer kids snacks. Hummus with toasted whole wheat pita triangles (kids love dips!) and/or fresh veggie strips-peppers, baby carrots, etc. To read an excerpt of "Feed Your Family Right," click here.